Mormon Wookiee: #100: The Last of the Human Freedoms. I have always loved movies (hopefully that is obvious, as half of my blog is dedicated to a 7'4 furry movie character from the fictional planet of Kashyyyk). I remember one Friday night as a teenager going to see a movie called "Life is Beautiful" with my older sister Amy and her best friend Alicia. I was completely unfamiliar with the movie, although Amy said the reviews were great (and I figured that no matter what the movie was, it was guaranteed to be better than Jurassic Park 2, which came out a few months earlier). Velociraptor Gymnastics: not a great moment in cinema. 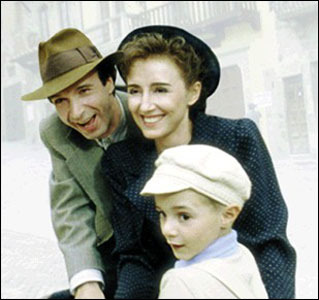 When "Life is Beautiful" began, I quickly noticed that it was in Italian and featured English subtitles. Although that was a little frustrating at first, it soon became easier and I didn't even notice that the actors weren't speaking English. The movie started out as a 1930s comedy about Guido, a Jewish-Italian shopkeeper, and his wife Dora, a beautiful school teacher. The movie was funny, light-hearted, and very enjoyable. Then suddenly the movie took a very dramatic turn, as Guido, Dora, and their young son Joshua were taken to a World War II Nazi concentration camp. Shortly thereafter, all of the Jewish children in the camp were taken from their parents and killed. Guido was able to hide Joshua from that point on by pretending that he and Joshua were playing a game in which Joshua needs to stay hidden from the guards. If he wins the game, Joshua will win a tank. In the end, Guido ultimately sacrifices his life while protecting Joshua for one final night. "Life is Beautiful" struck a powerful chord with me. After watching the movie, I became very interested in learning more about the Jewish people who were forced to endure so many hardships and lost so many of their lives. I soon read "The Hiding Place" by Corrie Ten Boom, "The Diary of Anne Frank", and "Man's Search for Meaning" by Dr. Victor E. Frankl. Just like "Life is Beautiful", these books were more than just stories of suffering and tragedy--they were stories of love, sacrifice, and the power of the human spirit. "We who lived in concentration camps remember the men who walked through the huts comforting others, giving away their last piece of bread. They may have been few in number, but they offer sufficient proof that everything can be taken from a man but one thing: the last of the human freedoms - to choose one's attitude in any given set of circumstances, to choose one's own way." I think of this quote often when I am having a bad day, when things don't seem to be going my way, or when I feel a bout of self-pity coming on. It reminds me that no matter what may happen--the loss of loved ones, the loss of worldly possessions, the loss of health and comfort--if we have keep our faith in God, we always have the last of the human freedoms--to choose to keep fighting for one more day. wow- what a great post! I really needed this today thank you so much for sharing!